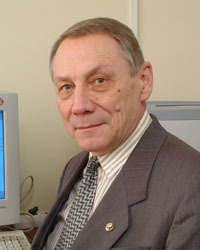 The head of the laboratory is Koverda Vladimir Petrovich, a corresponding member of RAN, Doctor of Physics and Mathematics, a laureate of the RF State Prize of 1999, the author of a monograph and more than 150 scientific papers. In 1965 at the Department of Physico-Technical Problems of Energetics of the Ural Branch of the USSR Academy of Sciences Dr. of Phys. and Math. V.P.Skripov organized a laboratory of thermal physics, which was oriented to the study of critical phenomena in a liquid-vapor system, properties of highly superheated liquids and nonequilibrium processes accompanied by phase transitions. In 1988 in connection with the organization of the Institute of Thermal Physics it was given the name “Laboratory of Phase Transitions and Nonequilibrium Processes”. The main directions of scientific investigations determined by the first head of the laboratory V.P.Skripov remain topical up to now, and thermophysical investigations of cryogenic liquids and their solutions have become the subject-matter of the laboratory of energetics and cryogenics, whose head in 1989 became V.G.Baidakov. Laboratory staff: 10 persons, including one academician and one corresponding member of the Russian Academy of Sciences, four Doctors and one candidate of Physics and Mathematics, one research associate, one engineer and one post-graduate student. Investigation of thermodynamic similarity in first-order phase transitions in a wide range of thermodynamic variables, including metastable states of substances. The workers of the laboratory have conducted complex investigations of the stability and the decay kinetics of supercooled liquids, developed methodological foundations and realized an experimental determination of the main characteristics of stability for metastable states of supercooled liquids and amorphous bodies. The regime of spontaneous explosive crystallization of amorphous systems has been differentiated for nonequilibrium processes with phase transitions, which is characterized by an intensive nucleation and extremely high rates of propagation of crystallization autowaves. A phenomenological theory of melting of crystalline nanoparticles as a process of thermofluctuation decay of the metastable state has been suggested. Taking into account the region of metastable states of coexistent crystal and liquid of a one-component substance (the region of stretched phase states) made it possible to use the methodology of thermodynamic similarity for describing melting and suggest an algorithm of calculating an unknown equilibrium line by the properties pertaining to melting at atmospheric pressure. In 1987 the workers of the laboratory joined in the work on high-temperature superconductivity. The technology of production was developed, and thin films of high-temperature superconductors with high critical parameters were obtained. For the first time intensive low-frequency pulsations with a power spectrum inversely proportional to the frequency (flicker-noise) were revealed by experiment in processes of heat and mass exchange with phase transitions. An original theory of fluctuation processes with a flicker power spectrum, according to which a flicker-noise arises as a result of imposition and interaction of nonequilibrium phase transitions, was suggested . The phenomenon of critical choking of a maximally nonequilibrium flow was discovered in investigations of flows of boiling-up liquids. The relation between the critical regime of outflow of a boiling-up liquid and the conditions of explosive boiling-up was established by experiment.